For a truly beautiful, handmade piece of functional art, discover the ceramics from Whitney Smith (www.whitneysmithpottery.com). One of our favorite items is the Bird Cake Plate, a wheel-thrown cake stand with sculpted birds perched on the edge. The 7-,9- or 11-inch stand is available is various color combinations and dresses up any cake. Another favorite is the Poppy Bowl. Carved and textured, this bright bowl is a joy to look at and even more fun to use! You can create your own registry at www.whitneysmithpottery.com, or you can find her creations at various stores throughout the Bay Area. Smith first got into pottery in Santa Cruz and now has a studio in Oakland. After the stress of planning a wedding, what could be better than a therapeutic relaxing mud bath and massage with your new other half? Various Wine Country spas offer couples packages, which is a great way to decompress together, particularly if your schedule doesn’t allow you to take off on your honeymoon immediately after your nuptials. What could be better than a gift that allows you to spend quality time with your new husband or wife? Consider adding a couples cooking class to your registry. You can learn to make each other’s favorite dishes while having a great time and enjoying outstanding food in the process! Tante Maria’s Cooking School in San Francisco’s North Beach (www.tantemarie.com) offers evening series and weekend workshop classes. A variety of classes are available including cooking basics; cakes and confections; cooking from the farmers’ market; meats and sauces; Latin, Mediterranean, Asian and French cooking; and much more. You can add a gift certificate or a specific course to your registry. For a lasting piece of art you can wear, add Jeanine Payer jewelry to your registry (www.jeaninepayer.com). Poetry is hand-engraved onto San Francisco-based Payer’s precious metal jewelry for meaningful and subtle adornment. A couple of our favorite pieces, which make a nice bride-and-groom set, are the Trixie necklace and Will cufflinks. Trixie features a quote by C. Haymes: “I believe in everything the heart can stand.” And Will features John Milton: “Freely we serve, Because we freely love, as in our will. To love or not; in this we stand or fall.” Custom pieces are also available. Besides supporting a local artist (plus 15 percent of proceeds from the light pink Dorothy Apron are donated to the National Breast Cancer Foundation), they’re really fun to wear and even more fun to display in your kitchen! The aprons make cooking that much more enjoyable — and with adorable matching dishes gloves, you might even find yourself volunteering to wash up! 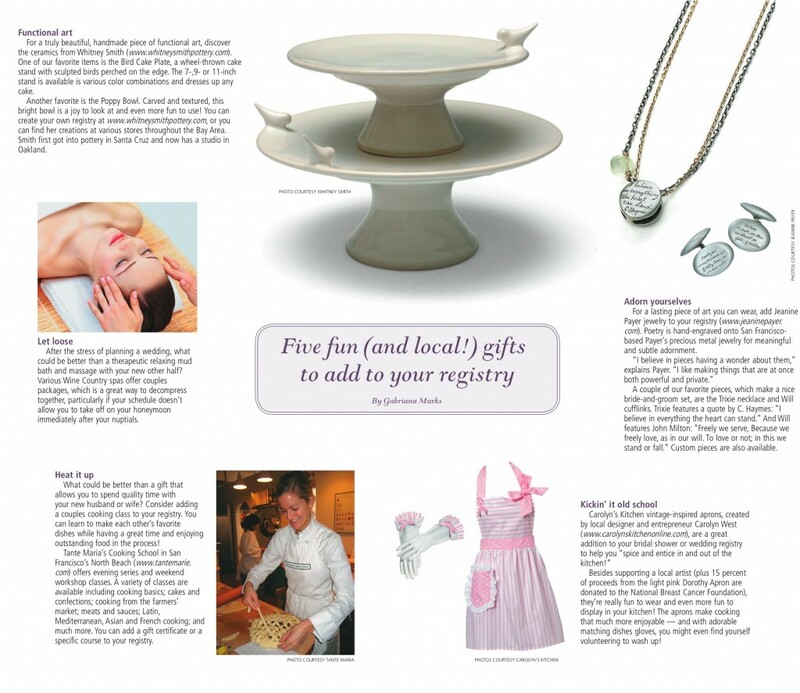 Article published in The San Fransisco Chronicle’s “Modern Bridal” custom publication in August 2008. Download PDF of original article to view fully layout with PHOTOS!